Home > Community > Contests & Winners > We Want To Send YOU On A 5-Day Hawaii Vacation! At Love With Food we think any chance for adventure should be savored (like a good snack), so we’re giving you the chance to win the ultimate adventure: a 5-day Hawaii vacation! And if that wasn’t enough to grab your attention, the winner will also get a ton of incredible prizes from great brands everyone knows and loves like Scentbird, Le Tote, and FabFitFun! We’re talking a $6,000 value, people – you can’t afford to miss out on this! Enter the sweepstakes below by the end of November 17th, 2016 for your chance to win and savor your adventure in paradise! *Open to U.S. residents only. Must be 21 and up. Win a Getaway to Hawaii + Other Awesome Prizes! A 7,000 Value! 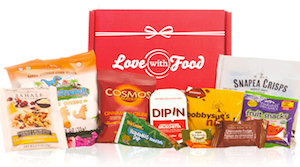 Love With Food helps you discover new organic, all-natural or gluten-free snacks delivered to your door monthly. Our membership starts as low as $7.99/month, and we donate a portion of the proceeds to help fight childhood hunger in the US and around the world. We want to send you and someone special on a 5-day vacation for 2 in gorgeous Oahu – airfare and lodging included! All you have to do is decide how you’ll savor your trip to paradise. Hiking? Relaxing on the beach? Sampling all the delicious food? We say all of the above. Scentbird was designed so even the pickiest girls (or boys!) can date luxury perfumes before marrying them and choose from among more than 400 luxury scents (like Dolce & Gabban and DKNY). With a year-long subscription to Scentbird you’ll get a 30-day supply of a new luxury fragrance each month! Barilla is an instantly recognizable name in pasta, sauces, and baked goods all over the world, but at its heart is still an Italian family-owned food company. You can win a case of Barilla’s classic and ever-delicious pasta for yourself, and a KitchenAid mixer to help you whenever the urge to get creative in the kitchen hits! Our Little Rebellion is starting a snack revolution against “better for you” snacks that taste like cardboard. Our Little Rebellion uses corn from non-GMO farms and ingredients that are easy to pronounce. They’re sending our sweepstakes winner the perfect pack for getting into the holiday spirit: apple cider, hot chocolate, mugs, a holiday movie box set, holiday decorations, snow toys (like snowball makers and igloos), a mittens and scarf set, a recipe book, and seasonal PopCorners. What more could you want? Foodstirs believes preparing and enjoying food together has incredible power, and was founded to help everyone make memories through baking. Their delicious products are made up of non-GMO and organic ingredients, so you never have to trade quality for taste. 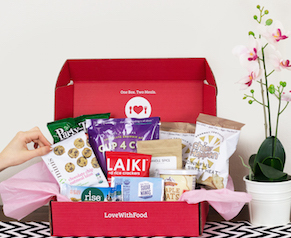 Our sweepstakes winner will get their own pack of amazing baking products and organic mixes from Foodstirs! Getting into the kitchen with your family has never been easier – or more fun. FabFitFun sends you the latest and greatest in seasonal home, fashion, fitness, wellness and beauty products (that’s full-size, mind you) to help make your life just a little bit more fabulous. Our sweepstakes winner will get a full year (that’s four boxes, one for each season) of fabulous gifts for free! Le Tote lets you rent the fashion you’ve always wanted, and does all the work for you. They’ll recommend and hand pick beautiful clothes and accessories and send them right to you. When you’re done with the clothes, just send them back – they’ll even handle the laundry! Our sweepstakes winner will win a bundle of fabulous gifts from the Le Tote team delivered right to your door! Munchery is all about making “what’s for dinner?” an easy question to answer while still being good for your health by delivering freshly made meals or easy-to-use cooking kits right to your door. And for every order Munchery donates a meal to a local food bank. Talk about a win-win. With a $500 gift card, you can try all that Munchery has to offer. Dinner stress = gone. Bright Cellars helps you discover new wines by sending you bottles that you might never try otherwise, based on your answers to a wine quiz that helps build your personalized taste profile. Our sweepstakes winner will get seven whole months of great wine wines from Bright Cellars delivered right to their door! Don’t wait! Enter above by November 17th, 2016 for your chance to win BIG!